The Harvard Sailing Center sinks into the Charles River on Thursday afternoon. 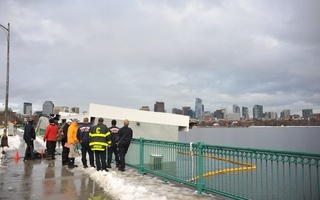 In the wake of a powerful Nor’easter, the Harvard Sailing Center partially sank into the Charles river Thursday. The sailing center—a boxy grey building that houses the College's varsity sailing team during the school year—sank slowly. 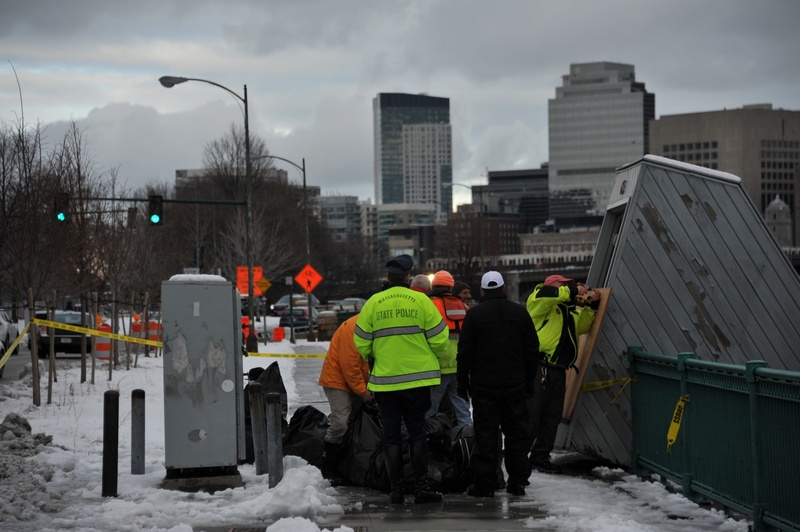 By 11:30 a.m., the barge that floats the structure as well as parts of the building itself had sunk beneath the surface of the Charles, according to the Boston Globe. In a press release Thursday, Athletics Director Robert L. Scalise wrote the sailing center sank due to issues with the flotation barge. 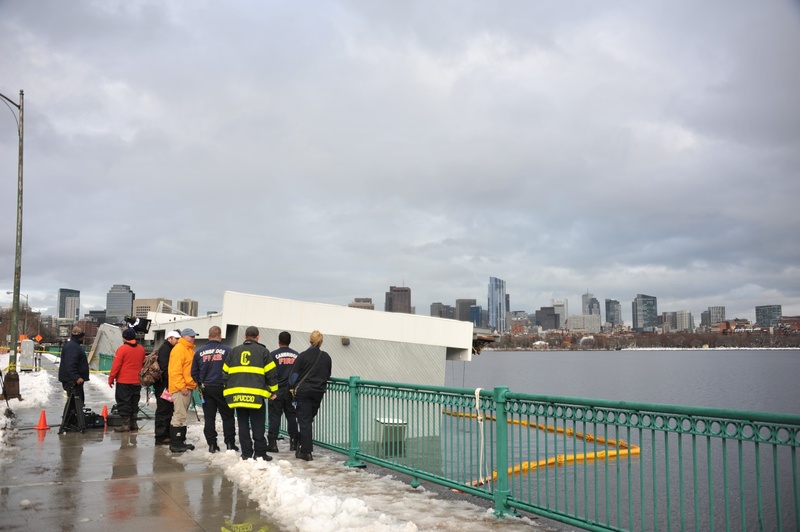 “The Harvard Sailing Center, located on the Cambridge side of the Charles River near the Longfellow Bridge, has been significantly compromised due to what currently appears to be a failure of the building’s flotation device,” Scalise wrote. 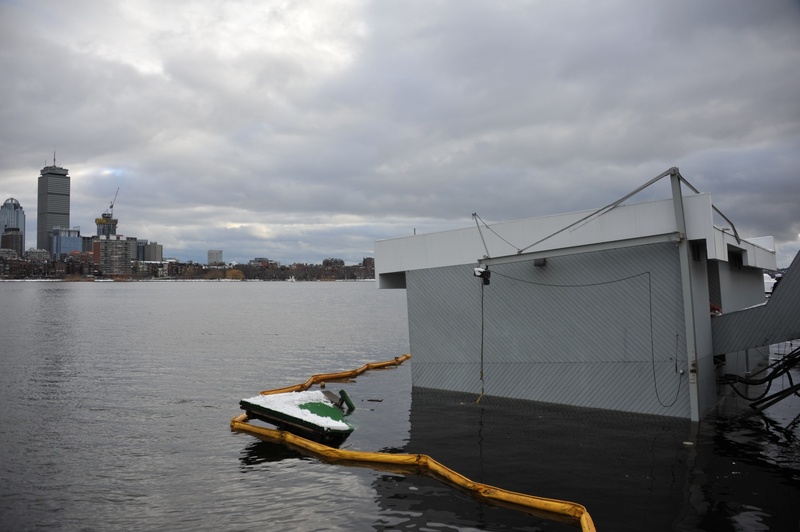 Watch the Harvard Sailing Center sink into the Charles river Thursday. The Cambridge Fire Department and Mass. State Police responded to the sinking alongside the Harvard University Police Department and Harvard Facilities Management Group, according to Scalise. By mid-afternoon, the scene appeared to be under control. A Cambridge fire truck arrived at the sailing center around 4:30 p.m. After briefly talking to Harvard employees, the man driving the fire truck turned the vehicle around and sped away. A state police officer took down the police tape that had previously blocked off the sidewalk in front of the Sailing Center. Two Harvard employees and a member of the Cambridge Fire Department standing nearby the sailing center Thursday afternoon declined to comment for this story. Though the varsity sailing team sails out of the center during the school year, the building houses the Crimson Sailing Academy over the summer. Both captains wrote they have been in touch with their coaches over the course of the day. As of publication, Karnovsky and Williams know of no definite plans for what the sailing team will do if students are unable to use the Sailing Center. Policemen gather by the sinking Harvard Sailing Center Thursday. 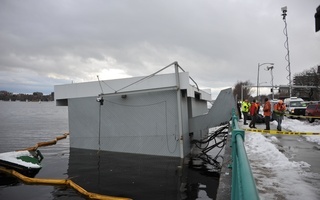 While the boathouse has had no reported structural issues in the past, Karnovsky and Williams would not immediately comment when asked if the boathouse has had similar issues in the past. In 1995 a helicopter crashed into the roof of the Harvard Sailing Center, then the Harvard Yacht Club, killing all four passengers. On a busy weekend for Harvard sailing, six different boats competed across three different regattas on the Charles River. The three regattas delivered contrasting results for the Crimson, highlighted by a third-place finish at MIT. The final regatta of the season was less than the best performance from the tea, finishing twelfth out of the 18 teams competing.